Walnuts…A Drug? This Is Outrageous!! 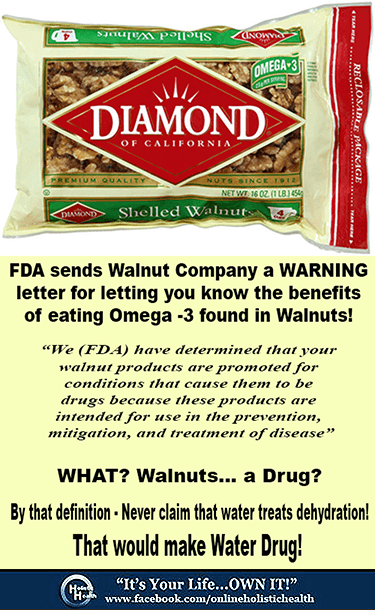 Diamond Walnuts received a warning letter from the FDA in 2010 for stating health benefits of omega-3 found in Walnuts based on research studies. And what was the offending statement? So I guess we aren’t allowed to let people know the benefits of eating food?…EVEN with “studies” PROVING the benefits! Hands down…this is one of the most ridiculous things I have ever seen!! ‹ Where’s The Cheese? › Scented Dryer Sheets Toxic For Your Health!